I received a B.S. in Geology from St. Lawrence University, Canton, NY, in 1974. During my time at St. Lawrence, I was able to participate in the Preliminary Examination Team activities at JSC after Apollo 17 - thanks to a previous association between my Department chair and Bill Phinney, the geologist who ran the Geology Branch at JSC at the time. I received an M.S. 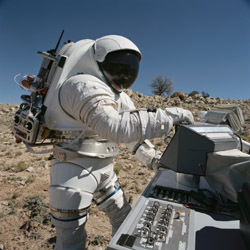 in Geology from the University of New Mexico in 1974 after an M.S. thesis mapping Tertiary volcanos in the Rio Grande Rift in northern New Mexico. After my M.S., I spent 4 years in the U.S. Army as a combat engineer officer, where I commanded a combat engineer company in the 4th Engineer Battalion at Fort Carson, CO. I received a Ph.D. in Geology from Arizona State University, where I conducted fundamental research on emplacement mechanisms of fragmental debris deposits, using the 400 year old Chaos Jumbles rock-fall avalanche deposit and the May 1915 blast and lahar deposits in Lassen Volcanic National Park, CA as models. 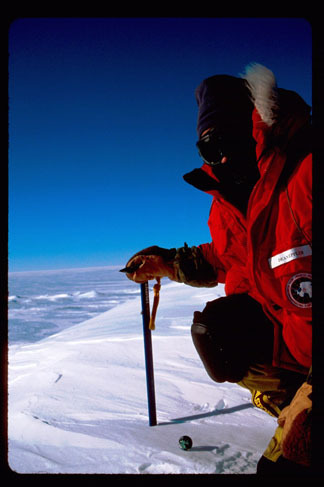 While at ASU, I also spent a season in the Antarctic with my advisor, Dr. Mike Malin - PI for the Mars Observer Camera - setting up experiment stations in the Antartic dry valleys to measure the long-term rate of weathering and erosion in cold desert environments. After my Ph.D., I held a brief position at Los Alamos National Laboratory conducting geothermal energy exploration in Central America and doing research on the effect of airborne volcanic ash on air transport aircraft. In 1986, I joined Science Applications International Corporation (SAIC), where I have worked for the past 17 years. I was initially in Las Vegas, NV, working on storage and disposal of high-level radioactive waste in geologic repositories, but moved to Houston, TX, in 1990 and have worked with NASA ever since. 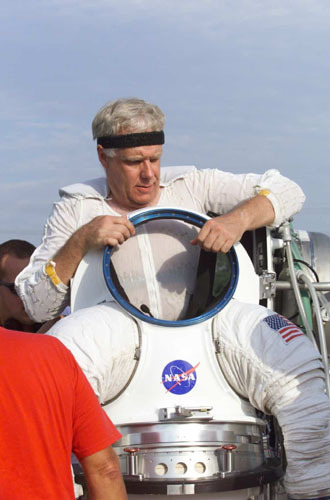 My present position is Discipline Manager for Earth Science Research aboard the International Space Station, and as principal suit test subject for advanced planetary EVA suit development. 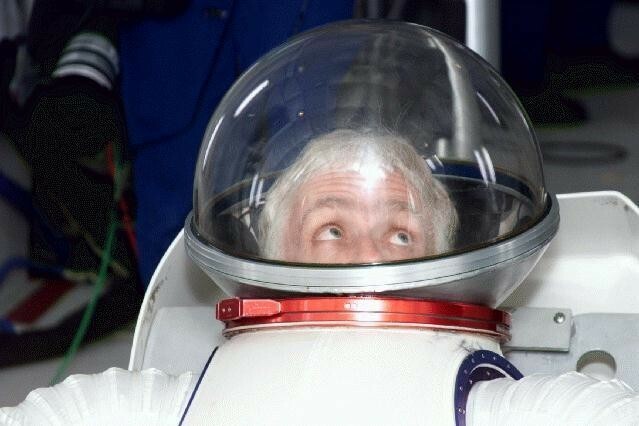 In my ISS position, I've been heading up a team for the last 9 years that has developed the high-optical quality nadir research window in the U.S. Destiny Laboratory, and has overseen the development of the Window Observational Research Facility (WORF), which is scheduled to fly on one of the first space shuttle flights after return to flight. I'm known to some folks as Mogh, Father of WORF. 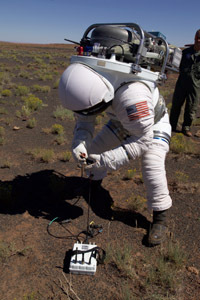 In the space suit development activity, I've been responsible for testing several advanced space suits in relevant terrestrial locations, primarily Flagstaff, AZ, where our team had evaluated suit mobility, procedures for setting up large solar arrays, human-robotic interaction, and general development activities that will lead to the eventual design and build of an advanced planetary EMU. In my spare time, I'm a horseman and aerobatic pilot, owning a 14 year old sorrel thoroughbred gelding and a Pitts Special S1S/T aerobatic biplane. 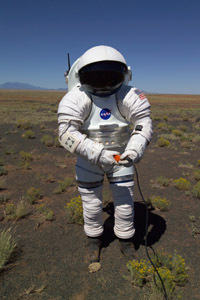 Attached are a series of photographs shot on the west side of Meteor Crater during our recent NASA Desert RATS field exercise. 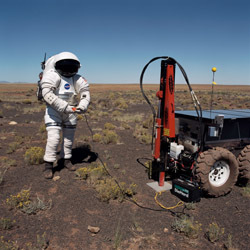 As an adjunct to the primary activities we were pursuing, Dr. Jim Reilly and Dr. Drew Feustel of the Astronaut Office have received some seed money to begin working on field deployable seismic equipment for planetary exploration. 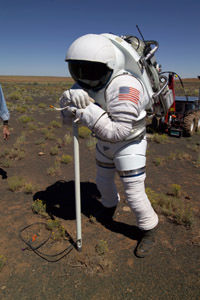 One of the tasks they worked on this year was to evaluate the work load, both shirt sleeve and suited, associated with deploying this equipment. 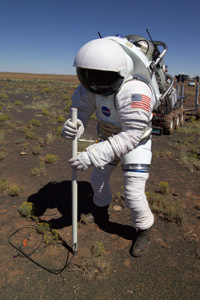 I did asuited run of approximately 30 minute involving geophones, connecting geophones to a data net, positioning a thumper with a prototype rover and firing the thumper. None of this equipment had been adapted to working in a suit, so this year's activity was a more qualitative (as opposed to quantitative) look at the general problems conducting this activity in a suit. 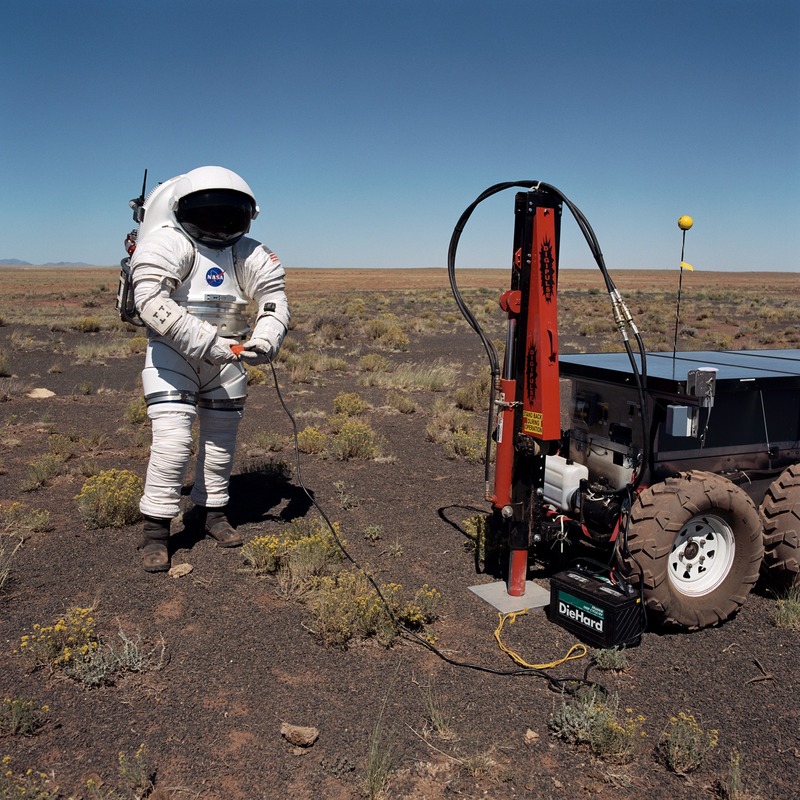 Jim and Drew are working with a local Houston seismic services company to develop a new set of sensors that will be better adapted to planetary surface operations; we hope to be testing those in field next year.